This blog was written as part of "The Pedagogy Project" by HASTAC scholars. Hackathon I wrote about not long ago. CRUNCH. So, we are currently participating in an intensive 10-week program, aiming to take our mobile idea from concept to alpha testing. Our app aims to facilitate college access among low-income high school students using local, community resources. I can't tell you how incredibly excited and pumped we are to gain clarity on our mobile app idea each week. Step 0: As Berkun states, the first step before the actual, real first step is to make sure you know what you will be talking about--refine your idea. Step 1: Identify the scope of your idea. If your idea is too broad and big, how will you be able to pitch it if your window of opportunity is 10 seconds or less? Once you have refined your idea and recognized the scope of your idea, do some research on how others are pitching ideas similar to yours. Step 2: Identify who you will pitch to. Knowing who you plan to talk to will have an impact in how you plan to pitch your idea. Know your audience. Step 3: Once you know who you will be talking to, think about how they see the world, and pitch your idea through that lense. Be aware of how your audience will think and possibly respond to your idea. Step 4: Recognize the structure of your pitch. The first iteration of your pitch should your elevator pitch, which should be 5 seconds. The 5 second elevator pitch is basically boiling your idea down to one clear and concise expression. Get perspective on your idea. Berkun also discusses have a 30 second version and a 5 minute version of your pitch, so you are ready for all opportunities to share your idea. Step 5: Test your pitch--not to yourself in a mirror but with others! People will think of questions you haven't even considered, which will greatly help you think critically and dynamically about your own idea. Step 6: Deliver that pitch you have been working on so hard! Berkun recommends you stay calm, be direct, and make your case. Sounds easy, right? Erin Reilly & Andrew Schrock) mean business! I thought this was a good out-of-the-box way to really apply what we were learning in our small classroom to the real world. Although it was a high-pressure activity (at least in my eyes and mind), it was very exciting and rejuvenating to practice applying our skills outside of the classroom. 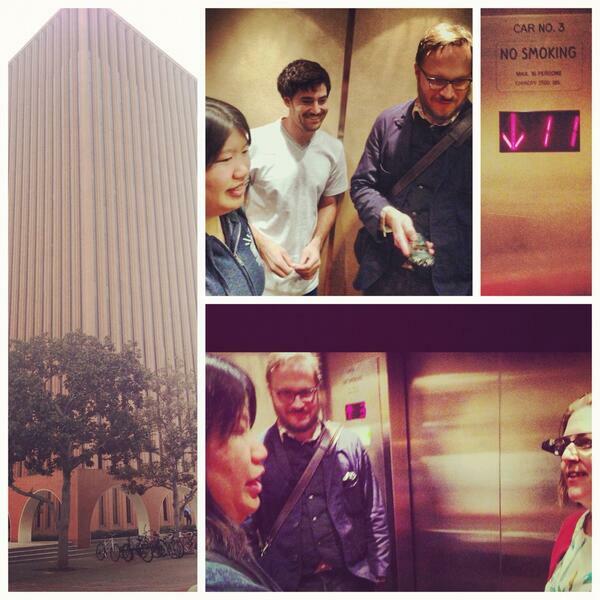 We went to the tallest building on campus and rode the elevator up 11 flights and back down 11 flights. Our professors had also requested that a member from another team also be in the elevator, so that those who were pitching could get extra feedback from an extra set of ears and eyes. While one professor used a voice recorder to document our pitch attempts, our other professor wore a set of Google Glasses to capture our behavior and demeanor as we tried to enact our entrepreneurial side. I'm teaching 'Rhetoric of Hacking' this semester, an intermediate rhet/comp class at UT-Austin, and the class has proven particulary interested in the concept of hackathons -- such that we're tentatively discussing restructuring the latter half of the course to incorporate a class-wide project modelled on such events. The students today requested a 'pitch meeting' in a couple of weeks time, which will also incorporate a roundtable discussion of the goals and parameters of such a project -- but I'm definitely going to pass on the article (or with your permission, maybe excerpt your summary for them) as they start to draft their pitches and talking points. The hackathon activity was such a refreshing exercise/activity, especially for someone who had never engaged in such think-on-your-feet type of events. It was great. Would love to hear about how you incorporate it into your class, because I have been mulling over ways I could organize one to get more educators to think and engage in experiences such as these. DML Competition finalists announced, apps up for comment!